Have crime prevention and risk assessment initiatives been implemented? For example, using guidelines for Crime Prevention Through Environmental Design (CPTED, pronounced as sep-ted). Are there occupied buildings with windows overlooking public spaces and streets? Is there quality street lighting, and lighting to public places, that enhances visibility and safety? Are pedestrian entrances to buildings prominent, well-lit and located with direct access from streets and public spaces? Do public spaces attract people, rather than discourage people from gathering? Are there multiple entry and exit points in public spaces and parks? Does the design encourage people to take pride in the place and its condition? For example, if they see some litter, they feel compelled to put it in a nearby rubbish bin. Is it clear who is responsible for the maintenance of a place? For example, if there is graffiti, weeds or broken equipment, people know who to contact to fix the problem. Is there a management strategy for maintaining, cleaning, repair and replacement? Are vehicles restricted to slow speeds on all roads except major arterial routes? For example, consider restricting speeds to 40km per hour on non-major roads. Is traffic slowed even further in areas of high pedestrian activity? For example consider restricting speeds to 20km per hour around shops, schools, university and hospital campuses. Is it convenient for pedestrians and bicycles to use and cross roads safely and with ease? For example, safe crossings are provided where convenient and logical for pedestrians, and kerb ramps are provided for wheeled access. Are there clear sightlines for visibility and safety for pedestrians and bicyclists? Is there physical separation of bicycles, pedestrians and vehicles? This is particularly important where there is a high volume of people walking and riding their bikes. An advisory document for incorporating Crime Prevention Through Environmental Design (CPTED) principles into planning and development activities in the ACT (Sarkissian Associates Planners, 2000, ACT Planning and Land Management). 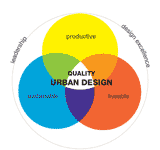 Guidelines promoting the incorporation of CPTED principles into the planning, design and management of development in Queensland (Queensland Government, 2007). A report presenting the findings of a study testing the potential for design-thinking to improve safety and vibrancy in Adelaide’s West End (Integrated Design Commission of South Australia, 2011). A matrix supporting an integrated approach to planning health and safe communities that provides practical advice for sythnesising a range of design considerations (Heart Foundation of Australia – Tasmania, 2011). National strategy aiming to reduce road deaths and serious injuries by 30 percent by 2020 (Australian Transport Council). Guidelines aiming to facilitate the planning of safer urban environments in Victoria (Victorian Department of Justice, Department of Sustainability and Environment, 2005).